Over two dozen people were hurt during a crash involving a jeep, SEPTA bus and tractor trailer in Delaware County Sunday afternoon. According to preliminary reports, the Route 113 bus was traveling southbound on Lansdowne Avenue when a Jeep Liberty pulled out of a driveway and onto the street. The jeep crashed into the bus which then collided with a tractor trailer that was stopped near the intersection, officials said. 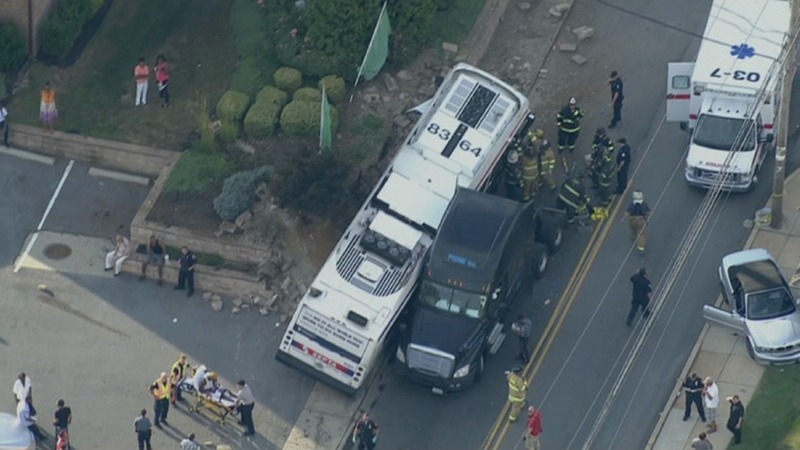 A SEPTA spokesman told NBC10 that 26 passengers on the bus and two pedestrians were injured in the crash. The spokesman said he did not know the conditions of the victims but none of the injuries appeared to be life-threatening. Yeadon Police and SEPTA are both investigating the accident.